Spoken in: Netherlands, Belgium, Suriname, Aruba, Netherlands Antilles, and other countries. Dutch ( Nederlands ) is a West Germanic language spoken by around 22 million people, mainly in the Netherlands and Belgium. 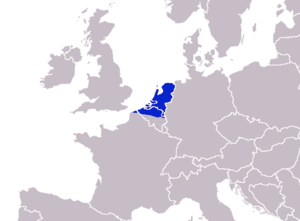 The history of the Dutch language begins around 450/500 AD, after Old Frankish, one of the many West Germanic tribal languages, was split by the Second Germanic consonant shift while at more or less the same time the Ingvaeonic nasal spirant law led to the development of the direct ancestors of modern Low Saxon, Frisian and English. The northern dialects of Old Frankish generally did not participate in either of these two shifts, except for a small amount of phonetic changes, and are hence known now as Old Low Franconian; the "Low" refers to dialects not influenced by the consonant shift. The most south eastern dialects of the Franconian languages became part of High, specifically Upper, German even though a dialect continuum remained. The fact that Dutch did not undergo the sound changes may be the reason why some people say that Dutch is like a bridge between English and German. Within Old Low Franconian there were two subgroups: Old East Low Franconian and Old West Low Franconian, which is better known as Old Dutch. East Low Franconian was eventually absorbed by Dutch as it became the dominant form of Low Franconian, although it remains a noticeable subtrate within the southern Limburgish dialects of Dutch. Because the two groups were so similar it is often very hard to determine whether a text is Old Dutch or Old East Low Franconian, hence most linguists will generally use Old Dutch synonymously with Old Low Franconian and most of the time do not differentiate. The transition between these languages was very gradual and one of the few moments linguists can detect somewhat of a revolution is when the Dutch standard language emerged and quickly established itself. It should be noted that Standard Dutch is very similar to most Dutch dialects. To actually see the evolution of the Dutch language the following, originally Old Dutch, sentence has been translated into Middle and Modern Dutch. A process of standardization started in the Middle ages, especially under the influence of the Burgundian Ducal Court in Dijon (Brussels after 1477). The dialects of Flanders and Brabant were the most influential around this time. The process of standardization became much stronger at the start of the 16th century, mainly based on the urban dialect of Antwerp. In 1585 Antwerp fell to the Spanish army: many fled to the Northern Netherlands, especially the province of Holland, where they influenced the urban dialects of that province. In 1637, a further important step was made towards a unified language, when the first major Dutch Bible translation was created that people from all over the United Provinces could understand. It used elements from various, even Low Saxon, dialects but was predominantly based on the urban dialects of Holland. Etymology of the word "Dutch"
The word Dutch comes from the proto-Germanic word *þeudisko-z, and became Duutsc in Middle Dutch, which later gave the two early modern Dutch forms, Duits in the north and Diets in the south. Duits has taken on the meaning of "German" and Diets meaning "Dutch" (along with "Nederlands") but no longer in general use (see the Diets article), dropped for its Nazi-era overtones. German Deutsch meaning "German" has the same origin. William Caxton (c. 1422–1491) wrote in his Prologue to his Aeneids in 1490 that an old English text was more like to Dutche than English. In his notes, Professor W.F. Bolton makes clear that this word means German in general rather than Dutch. In four books containing the Chronography and History of the whole world, Vol. II (London, 1677: 154) contains "…the Dutch call Leibnitz," adding that Dutch is spoken in the parts of Hungary adjoining to Germany. To this day, descendants of German settlers in southeastern Pennsylvania are known as the " Pennsylvania Dutch", especially those who are members of the plain sects. (Those who are not members of the plain sects often identify themselves as being Pennsylvania German). Dutch is a Germanic language, and within this family it is a West Germanic language. Since it did not experience the High German consonant shift (apart from þ→d), it is a Low Saxon-Low Franconian language (Low Germanic language), and it is most closely related to the Low Saxon variety of the West Germanic languages. There was in fact a dialect continuum which blurred any clear boundary between Dutch and Low Saxon, in some minute areas there are still tiny dialect continuums but they continue to go extinct. Dutch is grammatically similar to German, for example in syntax and verb morphology (for a comparison of verb morphology in English, Dutch and German, see Germanic weak verb and Germanic strong verb). Even when written Dutch looks similar to German, however, the pronunciation may be markedly different. This is true especially of the diphthongs and of the letter <g>, which is pronounced as a velar continuant similar to the <ch> in Swiss German. The rhotic pronunciation of <r> causes some English-speakers to believe Dutch sounds similar to a West Country accent; this is the reason for Bill Bryson's famous remark that when one hears Dutch one feels one ought to be able to understand it. Dutch pronunciation is, however, difficult to master for Anglophones, many of its diphthongs and gutturals being the greatest obstacles. Germans seem to have an advantage with the Dutch grammar, but suffer the same difficulties as the English when dealing with pronunciation. Dutch is generally not on the curriculum of German schools, except in some border cities, such as Aachen and Oldenburg. Dutch is spoken by practically all inhabitants of the Netherlands and Flanders, the northern half of Belgium where it is often referred to by the dialect name Vlaams (Flemish). It is also spoken in the bilingual region of Brussels, together with French and other languages. In the northernmost part of France, the Dunkirk arrondissement in the Nord département, Dutch is still spoken as a minority language, also often referred to by the dialect name Vlaams. On the Caribbean islands of Aruba and the Netherlands Antilles, Dutch is used but less so than Papiamento (Aruba, Curaçao, Bonaire) and English ( Sint Maarten, Sint Eustatius, Saba). Dutch is spoken as a mother tongue by about 60% of the population in Suriname, most of them being bilingual with Sranan Tongo and other ethnic languages (2005, Nederlandse Taalunie: , in Dutch). There are also some speakers of Dutch in Indonesia and in countries with a lot of Dutch migrants, such as Canada, Australia, New Zealand and the United States. In South Africa and Namibia a language closely related to Dutch, called Afrikaans is spoken. Dutch is an official language of the Netherlands, Belgium, Suriname, Aruba, and the Netherlands Antilles. The Dutch, Flemish and Surinamese governments coordinate their language activities in the Nederlandse Taalunie (' Dutch Language Union'). Dutch was an official language in South Africa up until 1961, having fallen into disuse since Afrikaans became an official language in 1925. A noticeable minority of the inhabitants of New Zealand, 16,347 (0.4%) are sufficiently fluent in Dutch to carry on an everyday conversation. Standaardnederlands or Algemeen Nederlands ('Common Dutch', abbreviated to AN) is the standard language as taught in schools and used by authorities in the Netherlands, Flanders, Suriname, Aruba and the Netherlands Antilles. The Dutch Language Union defines what is AN and what is not, for example in terms of orthography. Since efforts to uplift people came to be considered rather presumptuous, as reflected by the evolution of the vocabulary heard on television, the earlier name Algemeen Beschaafd Nederlands ('Common Civilized Dutch') and its abbreviation ABN have been replaced with Algemeen Nederlands and thus AN. The main Dutch dialectal groups. In Flanders, there are roughly four dialect groups: West Flemish, East Flemish, Brabantian and Limburgish. Some of these dialects, especially West and East Flemish have incorporated some French loanwords in everyday language. An example is fourchette in various forms (originally a French word meaning fork), instead of vork. Brussels, especially, is heavily influenced by French because roughly 85% of the inhabitants of Brussels speak French. The Limburgish in Belgium is closely related to Dutch Limburgish. An oddity of West Flemings (and to a lesser extent, East Flemings) is that, when they speak AN, their pronunciation of the "soft g" sound (the voiced velar fricative) is almost identical to that of the "h" sound (the voiced glottal fricative), thus, the words held (hero) and geld (money) sound nearly the same, except that the latter word has a 'y' /j/ sound embedded into the "soft g". When they speak their local dialect, however, their "g" is almost the "h" of the Algemeen Nederlands, and they do not pronounce the "h". Some Flemish dialects are so distinct that they might be considered as separate language variants, although the strong significance of language in Belgian politics would prevent the government from doing so. West Flemish in particular has sometimes been considered as such. Dialect borders of these dialects do not correspond to present political boundaries, but reflect older, medieval divisions. The Brabantian dialect group, for instance, also extends to much of the south of the Netherlands, and so does Limburgish. West-Flemish is also spoken in part of the Dutch province of Zeeland, and even in a small part near Dunkirk, France, bordering on Belgium. The Netherlands also have different dialect regions. In the east there is an extensive Low Saxon dialect area: the provinces of Groningen ( Gronings), Drenthe and Overijssel are almost exclusively Low Saxon. Zuid-Gelders is a dialect also spoken in the German land of North Rhine-Westphalia. Brabantian ( Noord-Brabant) fades into the dialects spoken in the adjoining provinces of Belgium. The same applies to Limburgish ( Limburg (Netherlands)), but this variant also has the status of official regional language in the Netherlands (but not in Belgium). It receives protection by chapter 2 of the European Charter for Regional or Minority Languages. Limburgish has been influenced by the Rhinelandic dialects like the Cologne dialect: Kölsch Platt, and has had a somewhat different development since the late Middle Ages. In some rural Hollandic areas more authentic Hollandic dialects are still being used, especially north of Amsterdam. Limburgish and Low Saxon have been elevated by the Netherlands (and by Germany) to the legal status of streektaal ( regional language) according to the European Charter for Regional or Minority Languages, which causes some native speakers to consider them separate languages. Some dialects are unintelligible to some speakers of Standard Dutch. In addition to the many dialects of the Dutch language many provinces and larger cities have their own accents, which are usually accompanied by a particular dialect. Ethnic minority communities tend to have varying accents: for example many people from the Dutch Antilles or Suriname speak with a " Surinaams" accent, and the Dutch-Moroccan and Dutch-Turkish youth have also developed their own accents, which in some cases are enhanced by a debased Dutch slang with Arabic or Turkish words thrown in; a prominent feature of the latter two accents is the excessive use of the imperative. Afrikaans is derived from Dutch and is one of the 11 languages of South Africa and the mother tongue of about 15% of its population and spoken or understood by many more. Afrikaans originated from modern Dutch (1500 - present). Before the United Kingdom took control of South Africa from the Netherlands in 1814, the Afrikaans language (which wasn't called or considered Afrikaans at that time) was exposed to a steady stream of Dutch language influence, and the two languages were therefore almost identical. The differentiation and major changes from Dutch started when the Dutch settlers moved deep inland ( Trek Boers). In addition, when the UK seized South Africa, the Dutch language spoken in South Africa was practically cut off from other Dutch-speaking areas, allowing the language to differentiate and evolve further. In 1922 the Afrikaans language was recognized as one of South Africa's official languages, alongside Dutch and English. Dutch was formally derecognized in South Africa only in 1984 (since 1961 it had merited only a mention in the legislation). By that time however it had no longer been in everyday official use for a long time. The distinction of Afrikaans from the Dutch language was perhaps briefly in danger just after the Second World War when a great number of Dutch immigrants chose South Africa as their new homeland. However, the Afrikaans language survived the new influx of Dutch language which presented the danger of turning Afrikaans into a mixed language. Practically all of the Dutch immigrants and their descendants now speak Afrikaans instead of Dutch, be it (in the case of the Dutch-born parents) with a slight accent. A great deal of mutual intelligibility still exists. Someone who is able to speak Dutch usually can read and understand Afrikaans (especially when the native dialect is Hollandic, Zealandic, Flemish or Brabantic). There are also Dutch-based creole languages. Because of the turbulent history of both the Netherlands, Belgium as well as the Dutch language, the names that other peoples have chosen to use to refer to it vary more than for most other languages. 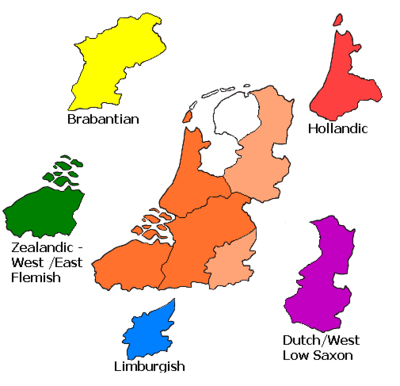 Mostly the name is derived either from " Holland" an important historical province, or a translation of "Low Countries", but many other variants exist including those deriving from "Flanders", the ancient Germanic word for "the people" and ancient Germanic tribes living in the region of the Low Countries at the time of the Roman Empire. The vowel inventory of Dutch is large, with 14 simple vowels and four diphthongs. 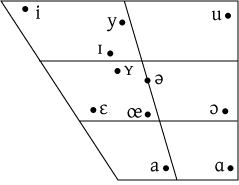 The vowels /eː/, /øː/, /oː/ are included on the diphthong chart because they are actually produced as narrow closing diphthongs in many dialects, but behave phonologically like the other simple vowels. [ɐ] (a near-open central vowel) is an allophone of unstressed /a/ and /ɑ/. 1) [g] is not a native phoneme of Dutch and only occurs in borrowed words, like goal. 2) [ʔ] is not a separate phoneme in Dutch, but is inserted before vowel-initial syllables within words after /a/ and /ə/ and often also at the beginning of a word. 3) In some dialects, notably that of Amsterdam, the voiced fricatives have almost completely merged with the voiceless ones, and [v] is usually realized as [f], [z] is usually realized as [s], and [ɣ] is usually realized as [x]. 4) [ʃ] and [ʒ] are not native phonemes of Dutch, and usually occur in borrowed words, like show and bagage (baggage). And even then they are usually realized as /sj/ and /zj/ respectively. However, /s/ + /j/ phoneme sequences in Dutch are often realized as /sj/, like in the word huisje (='little house'). In dialects that merge s and z [zj] often is realized as [sj]. 5) The realization of the /r/ phoneme varies considerably from dialect to dialect. In "standard" Dutch, /r/ is realized as [r]. In many dialects it is realized as the voiced uvular fricative [ʁ] or even as the uvular trill [ʀ]. 6) The realization of the /ʋ/ varies considerably from the Northern to the Southern and Belgium dialects of the Dutch language. In the South, including Belgium, it is sometimes realized as [w]. Some, mainly Hollandic, dialects nearly pronounce it like [v]. Dutch devoices all consonants at the ends of words (e.g. a final /d/ becomes [t]; to become 'ents of worts'), which presents a problem for Dutch speakers when learning English. This is partly reflected in the spelling, the singular huis has the plural huizen (house(s)) and duif becomes duiven (dove). The other cases, viz. ‘p’/‘b’ and ‘d’/‘t’ are always written with the voiced consonant, although a devoiced one is actually pronounced, e.g. sg. baard (beard), pronounced as baart, has plural baarden and sg. rib (rib), pronounced as rip has plural ribben. Because of assimilation, often the initial consonant of the next word is also devoiced, e.g. het vee (the cattle) is /(h)ətfe/. This process of devoicing is taken to an extreme in some regions (Amsterdam, Friesland) with almost complete loss of /v/,/z/ and /ɣ/. Further south these phonemes are certainly present in the middle of a word. Compare e.g. logen and loochen /loɣən/ vs. /loxən/. In the South (i.e. Zeeland, Brabant and Limburg) and in Flanders the contrast is even greater because the g becomes a palatal. ('soft g'). The final 'n' of the plural ending -en is often not pronounced (as in Afrikaans where it is also dropped in the written language), except in the North East (Low Saxon) and the South West (West Flemish) where the ending becomes a syllabic n sound. Dutch is a stress language, the stress position of words matters. Stress can occur on any syllable position in a word. There is a tendency for stress to be at the beginning of words. In composite words, secondary stress is often present. There are some cases where stress is the only difference between words. For example vóórkomen (occur) and voorkómen (prevent). Marking the stress in written Dutch is optional, never obligatory, but sometimes recommended. The syllable structure of Dutch is (C)(C)(C)V(C)(C)(C)(C). Many words, like in English, begin with three consonants - e.g. straat (street). There are words that end in four consonants - e.g. herfst (autumn), ergst (worst), interessantst (most interesting), sterkst (strongest) - most of them being adjectives in the superlative form. Dutch (with the exception of the Limburg dialects) did not participate in the second Germanic (High German) Sound Shift - compare German machen /-x-/ Dutch maken, English make, German Pfanne /pf-/, Dutch pan, English pan, German zwei /ts-/, Dutch twee, English two. Dutch underwent a few changes of its own. For example, words in -old or -olt lost the l in favour of a diphthong as a result of vocalisation. Compare English old, German alt, Dutch oud. Germanic */uː/ turned into /y/ through palatalization, which sound in turn became a diphthong /œy/, spelt 〈ui〉. Long */iː/ also diphthongized to /ɛi/, spelt 〈ij〉. 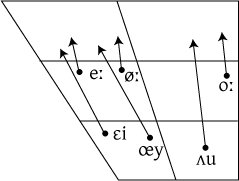 The phoneme /ɡ/ became a voiced velar fricative /ɣ/, or a voiced palatal fricative /ʝ/ (in the South: Flanders, Limburg). Like all other continental West Germanic languages, Dutch has a word order that is markedly different from English, which presents a problem for some Anglophones learning Dutch. As an illustration, consider a subtitle from the Dutch release of ' Star Trek: Voyager' episode 7X17, "Workforce Part II": when Captain Kathryn Janeway ( Kate Mulgrew) warns her erstwhile romantic partner Jaffen ( James Read) not to get involved in a shipboard battle, he responds in English "I've been involved since the day I met you." The Dutch subtitle appropriately reads, "Ik doe al mee sinds ik je ken," which translates directly as "I do already with since I you know." The Dutch written grammar has simplified over the past 100 years: cases are now mainly used for the pronouns, such as ik (I), mij, me (me), mijn (my), wie (who), wiens (whose masculine singular), wier (whose, feminine or plural), although the latter is quite formal and rarely used in speech, comparable to English ‘whom’. Nouns and adjectives are not case inflected (except for the genitive of proper nouns (names): -'s or -'). In the spoken language cases and case inflections had already gradually disappeared from a much earlier date on (probably the 15th century) as in many continental West Germanic dialects. Like most Germanic languages, Dutch forms noun compounds, where the first noun modifies the category given by the second, for example: hondenhok (doghouse). Unlike English, where newer compounds or combinations of longer nouns are often written in open form with separating spaces, Dutch (like the other Germanic languages) either uses the closed form without spaces, for example: boomhuis (eng. tree house) or hyphenated: VVD-coryfee (outstanding member of the VVD, a political party). Like German, Dutch allows arbitrarily long compounds, but the longer they get, the less frequent they tend to be. The longest serious entry in the Van Dale dictionary is wapenstilstandsonderhandeling (ceasefire negotiation). Sometimes hottentottensoldatententententoonstellingsterreinen (hottentot soldiers tents exhibition terrains) is jocularly quoted as the longest Dutch word (note the four times consecutive ten), but outside this usage it actually never occurs. Notwithstanding official spelling rules, many Dutch people nowadays tend to write the parts of a compound separately, which is sometimes dubbed “the English disease”. Like English, Dutch includes words of Greek and Latin origin. Its number of Romance-based loanwords is higher than in German, but much lower than in English. Especially on the streets and in many professions, there is a steady increase of English loanwords, rather often pronounced or applied in a different way. Except for the adverbs überhaupt and sowieso, the few German loanwords are relatively rarely used. The Dutch vocabulary is one of the richest in the world and comprises over 350,000 headwords. Dutch is written using the Latin alphabet, (see Dutch alphabet). One of the clues to recognise that a piece of text is written in Dutch is the occurrence of many doubled letters. This happens both to vowels and consonants. One cause is the many compound words where the same letter ends one part and begins the next part. Another cause is formed by spelling devices used to distinguish the many more vowel sounds in the Dutch language, than there are vowel letters in the Latin alphabet (see Dutch orthography). A prime example is the word voorraaddoos (supply box). The diaeresis (called trema) is used to mark vowels that are pronounced separately. In the most recent spelling reform, a hyphen has replaced the diaeresis in compound words (i.e., if the vowels originate from separate words, not from prefixes or suffixes), e.g. zeeëend (seaduck) is now spelled zee-eend. The acute accent (accent aigu) occurs mainly on loanwords like café, but can also be used for emphasis or to differentiate between two forms. Its most common use is to differentiate between the indefinite article 'een' (a, an) and the numeral 'één' (one); also 'hé' (hey, also written 'hee'). The grave accent (accent grave) is used to clarify pronunciation ('hè' (what?, what the ...?, tag question 'eh? '), 'bèta') and in loanwords ('cassière' (cashier), 'après-ski'). In the recent spelling reform, the accent grave was dropped as stress sign on short vowels in favour of the accent aigu (e.g. 'wèl' was changed to 'wél'). Other diacritical marks such as the circumflex only occur on a few words, most of them loanwords from French. The most important dictionary of the modern Dutch language is the Van Dale groot woordenboek der Nederlandse taal , more commonly referred to as the Dikke van Dale ("dik" is Dutch for "fat" or "thick"), or as linguists nicknamed it: De Vandaal (the vandal). However, it is dwarfed by the "Woordenboek der Nederlandsche taal", a scholarly endeavour that took 147 years from initial idea to first edition, resulting in over 45,000 pages. The official spelling is given by the Wet schrijfwijze Nederlandsche taal (Law on the writing of the Dutch language; Belgium 1946, Netherlands 1947; based on a 1944 spelling revision; both amended in the 1990's after a 1995 spelling revision). The Woordenlijst Nederlandse taal, more commonly known as "het groene boekje" (i.e. "the little green book", because of its colour), is usually accepted as an informal explanation of the law. However, the official 2005 spelling revision, which reverted some of the 1995 changes and made new ones, has been welcomed with a distinct lack of enthusiasm in both the Netherlands and Belgium. As a result, the Genootschap Onze Taal (Society Our Language) decided to publish an alternative list, "het witte boekje" ("the little white book"), which tries to simplify some complicated rules and offers several possible spellings for many contested words. This alternative ortography is followed by a number of major Dutch media organisations but mostly ignored in Belgium. The number of non-native speakers of Dutch who voluntarily learn the language is small. This is partly because Dutch is not geographically widespread and because in its home countries the Netherlands and Belgium most of its speakers are proficient in other European languages. In the Netherlands German is spoken with varying levels of proficiency (especially in the regions bordering Germany) and the language is part of the core curriculum in schools for 2-5 years. In Belgium, German is less widely spoken, and not always required, but it still spoken by a considerable number of people. French is also taught for 2-6 years in the Netherlands, but it is not as widely spoken. In Flanders (Belgium) French is required from age 10 to 18 (from 8 to 18 for Dutch-language schools in bilingual Brussels) and is very widely spoken, not so strange when one considers that the southern half of Belgium is Francophone. But on the other hand, Francophone Belgians are far less proficient in Dutch; recently, Walloon schools were allowed to choose to teach English as first foreign language, instead of Dutch. In the Netherlands, English is taught in schools from a young age - occasionally from age 11 or 12, and in Flanders from the age of 13 or 14, but typically until the completion of secondary education. Most universities in the two countries, recognizing the importance of the English language in the modern world, continue to teach the language to those students who need to improve their skills. As a result English is spoken throughout the Netherlands and Belgium with members of the younger generation sometimes being fluent or near fluent speakers. The majority of the population of both countries speaks some English. Some non-native residents of the Netherlands and of Belgium have never learnt to speak Dutch, probably because of a perception of its difficulties. In addition, native Dutch speakers themselves are often so linguistically proficient (or consider themselves to be so) that they will try to help a struggling Dutch learner by replying in his or her own (second) language – usually English, or in Belgium also French. The Dutch often make fun of their own language — for example Tom Meyer, a radio commentator, used to say on air that "Dutch isn't a language; it's a disease of the throat." Pronunciation can be a challenge as many of the Dutch vowel sounds are difficult for non native speakers. Diphthongs such as the "ui" sound in such words as "zuid" (south) or "huis" (house), the "eu" in "keuze" (choice) or "sleutel" (key), and the "ij" sound in words like "mijt" (mite) or "wijn" (wine) present difficulties and even though some of these words are superficially like their English equivalents the correct sound is very different. Its cohesiveness sometimes also produces words that might baffle speakers of other languages due to the high amount of consecutive consonants, such as the word "angstschreeuw" (scream in fear), which has grand total of eight in a row (ngstschr). It has to be noted though that the pronunciation of a word can differ greatly from its written form. In this case, "angstschreeuw" actually features 6 consonants (ng-s-t-s-ch-r) originating from two distinct linked words ("angst" and "schreeuw"), which is reduced further in everyday pronunciation by blending consecutive consonants into one sound - e.g. "ch" and "r". Native speakers of German usually have the biggest advantage of all people when learning Dutch from a grammar and vocabulary point of view but almost always struggle with the pronunciation. However, those residents or visitors who do learn some Dutch will be rewarded, not only by the extra fillip this gives to their understanding of Dutch history and culture, but also because it will enable them to converse with people in areas away from the big cities where other languages are less commonly spoken and experience other Dutch culture. Do you speak English? Spreekt u Engels? spɾeːkt y ɛŋəls? The language of Flanders: "Dutch" or "Flemish"? Dutch is the language of government, education, and daily life in both The Netherlands and Flanders, the northern part of Belgium. There is no officially recognized language called Flemish, and, both the Dutch and Belgian governments adhere to the standard Dutch (Algemeen Nederlands) defined by the Taalunie (Language union). The actual differences between the spoken language of Dutch and Belgian speakers, are comparable to the differences between American and British English. Some of these differences are recognized by the Taalunie and major dictionaries as being interchangeably valid, although some dictionaries and grammars may mark them as being more prevalent in one region or the other. Note that unlike between American and British English, a boundary may be loosely implied to follow a different geographical line within the Dutch language area according the precise distinction of Flemish. The use of the word Flemish (Vlaams in Dutch) to describe the standard Dutch language including its variations prevalent in Flanders and used there, is fairly common in the Netherlands and Belgium. Flemish is also a collective term often used for the Dutch dialects spoken in Belgium. However, Flemish, in a linguistic context refers to a much more limited number of Dutch dialects. The adjective Flemish for anything connected to, originating in or describing Flanders, led to the use of the substantive referring to Dutch as used by its native speakers in Belgium, and this is the meaning given in most dictionaries, including the Dutch Van Dale dictionary. Dutch simply cannot be called a German dialect, on whatever level of analysis we choose to consider the matter. The Dutch standard language, by definition, cannot be a dialect of another standard language, in this case Standard German. The dialect group from which Dutch is largely derived, Low Franconian, belongs to the whole of continental West Germanic dialects. This whole is sometimes imprecisely indicated with the word "German", but it might as well be called "Dutch". Indeed the Low Franconian dialects and languages are morphologically closer to the original form of Western Germanic than the High German from which standard German is derived. No intrinsic quality of whole of the component dialects favours one standard over the other: both were rivals and historical contingency decided the range of their use. The state border does not reflect dialectal subdivisions. Only now that the dialect continuum of continental West Germanic has been broken by the 19th century introduction of mass education, the respective ranges have been fixed; in the 18th century standard Dutch was still used as the normal written standard in the Lower Rhine, the county of Bentheim and East Frisia, now all part of Germany. Frisian, however, is even more closely related to the Middle-English descendants than Dutch. Languages and dialects sharing some features found in English and Frisian are referred to as Anglo-Frisian languages or, sometimes, Ingvaeonic languages. Pennsylvania Dutch, called Deitsch by its speakers, is not a form of Dutch. The word Dutch has historically been used for all speakers of continental West Germanic languages, including, the Dutch, Flemish, Austrians, Germans, and the German-speaking Swiss. It is cognate with Dutch archaism Diets (meaning "Dutch") and the German autodesignation deutsch. The use of the name Dutch exclusively for the language of Belgium, or for the inhabitants of the Netherlands or some of its former colonies, dates from the early 16th century. Pennsylvania Dutch is a West Central German variety.